Pestle & Mortar was founded by a busy mother, Sonia Deasy, and her biochemist sister. The two women began to develop a collection of fuss-free skin care products which followed the ‘less-is-more’ approach to leave women looking and feeling their very best. Sonia wanted the name of her skincare collection to reflect her values; thus, ‘Pestle & Mortar’ was born. The brand’s philosophy of using only natural and simple ingredients is echoed in its name- Pestle and Mortars were originally used to grind herbal medicines and food; the simple, yet effective device which has been utilized for centuries was exactly what Sonia wanted her brand to stand for. The brand quickly received a strong customer following through word of mouth, due to how effective the products were for creating hydrated and healthy-looking skin using all-natural ingredients. The Pure Hyaluronic Serum is, perhaps, one of Pestle & Mortar’s best known products. The Pure Hyaluronic Serum is suitable for even the most sensitive skin and works to soothe, hydrate and restore elasticity into the to reduce the appearance of fine lines- a tell-tale sign of aging. Hyaluronic Acid is one of the most water-loving molecules nature has to offer and can absorb up to 1000 times its weight in water- making it an excellent ingredient for hydrating thirsty skin. The act of double-cleansing has been hailed as an essential step of your skin care regime. Pestle & Mortar’s The Double Cleanse System is made up from three products; a makeup removing balm, a lightweight gel cleanser and a double cleanse facial cloth. Double cleansing is essential for keeping your skin looking bright, clear and youthful. The Double Cleansing System will leave your skin feeling cleansed, balanced and nourished every day of the week. 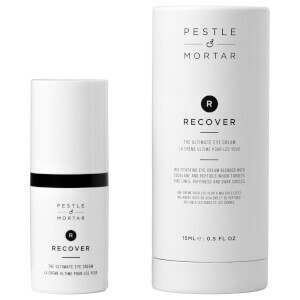 Pestle & Mortar’s Hydrate Moisturizer boasts a unique blend of patented peptides which work to reduce the appearance of fine lines and wrinkles by stimulating the production of collagen to restore skins firmness and elasticity. Jojoba and Squalene work as natural moisturizers to soften and firm the skin, while pomegranate, green tea and vitamin E work together to fight free radicals on the skin. Skin will be left plumped, moisturized and blemish-free, while the airless container ensures that the active ingredients are protected with every use. 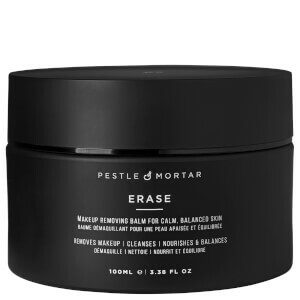 Discover more from Pestle & Mortar at SkinStore- the #1 destination for premium beauty.